Are We Now on Recession Watch?Are We Now on Recession Watch? Are We Now on Recession Watch? 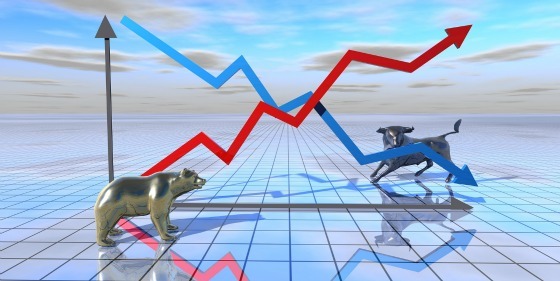 The CFA Institute recently polled its members regarding whether the United States will enter into a recession in 2016. 875 members responded and the following table shows the results. Will the US Experience a Recession in 2016? 70% are in the camp that a recession will not take place in 2016. This is understandable given that most of the economic and financial pain is taking place overseas in China and countries dependent on China as well as the oil producers. In addition, the labor market appears to be relatively healthy, fiscal policy is loosening up a bit with the new budget agreement and, although the energy sector is hurting immensely, a large segment of the population should benefit from lower gas prices. “Volatility is king. Markets have been indifferent to claims that the latest broad sell-off of equities, lower quality corporate bonds, and certain emerging market currencies exaggerate any worsening of observable fundamentals. He focuses his latest commentary on special financial events, particularly high volumes of mergers and acquisitions, as signs of being in the late stage of an economic cycle. 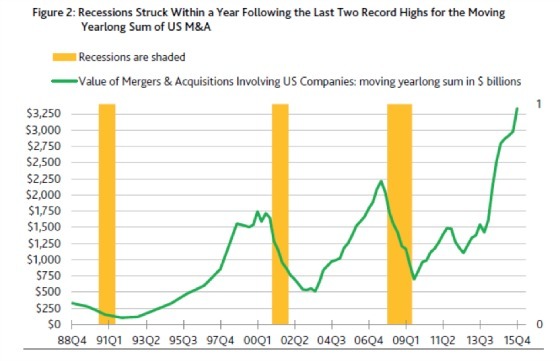 As the chart above shows, during the last three recessions, they commenced within one year of the value of mergers and acquisitions peaking for that cycle. This makes sense as they are often fueled by very welcoming credit markets that offer higher leverage, compelling interest rates, and borrower-friendly loan terms. Eventually, credit quality deteriorates (e.g. energy), lenders pull back, the cost of capital rises, M&A activity drops significantly, and this drop, along with a tightening of credit, can exacerbate economic weakness that is often starting to materialize. A recession then follows. The following graph shows how credit quality is starting to deteriorate and how it is showing up in higher credit spreads and a rapidly rising expected default frequency. 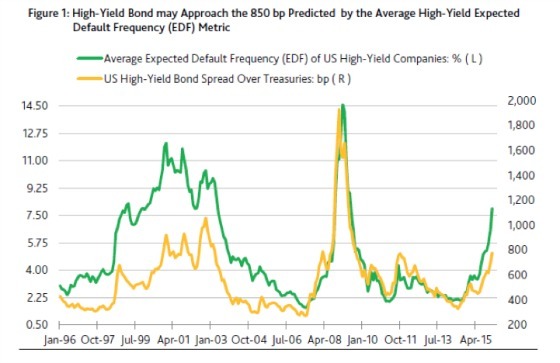 The expected default frequency is influenced by the ratio of upgrades to downgrades for M&A-linked bonds. 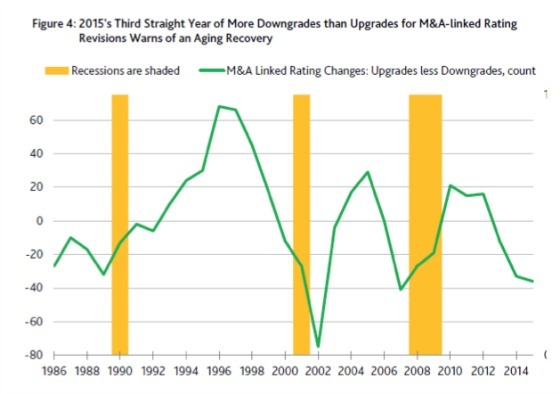 Early in an M&A cycle, these events are usually a credit positive and lead to more ratings upgrades than downgrades. As the business and credit cycles mature, however, the numbers reverse as downgrades exceed upgrades as the following chart shows. One can see that we are following the same pattern of early-staged upgrades exceeding downgrades giving way to later-staged downgrades topping upgrades. Recessions followed in the previous two cycles. On the other hand, it’s always dangerous to extrapolate from only two observations. Lonski ends his piece somewhat perplexed. There is an historical precedent that when equity markets are strong and produce multiple years of high returns, companies will often take advantage of high equity prices to issue more stock which is obviously friendly for bondholders as this reduces leverage. The opposite is true when companies buy back stock and pay dividends. 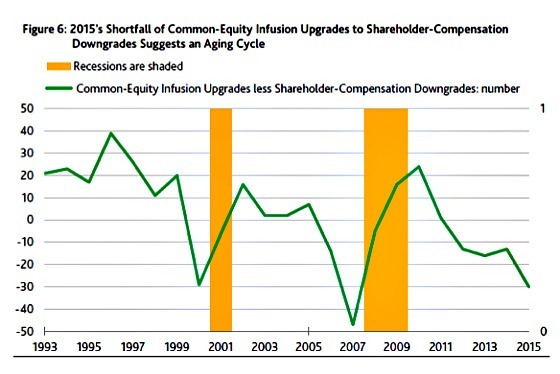 The following chart shows the difference in the number of upgrades due to equity infusions versus downgrades from shareholder compensation. Many pundits have complained about companies focusing far more on financial engineering than investing in their businesses to generate stock returns and that this trend could not last. It appears that the chickens may be coming home to roost. Although Lonski only graphically shows the last two to three economic cycles, they do follow very similar patterns, which is not surprising. In the words of Hyman Minsky, “Stability breeds instability.” Early acquirers of companies buy them cheaply under conservative lending terms. These investments do very well which leads to more debt and equity capital coming into the market which fuels more buyouts. The increasing asset values reflect favorably on the collateral value of lenders and great returns for equity investors. This activity in some cases can contribute favorably to economic output which can help the economy. Eventually, however, too much capital begins to chase opportunities in ways that require investors to increase their assumptions about future operating performance that are far too aggressive and/or they need highly aggressive debt-fueled dividend recapitalizations a few years into the investment to hit their pie-in-the-sky return targets. Eventually business fundamentals disappoint, lenders pull back, the cost of capital rises, M&A deals start to underperform, company and credit restructurings ensue, growth reverses, layoffs result, and a recession follows. This sequence of events is what makes leverage and M&A activity be what is known as “pro-cyclical”. 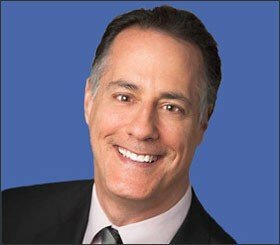 More leverage leads to more growth and a credit contraction can lead to a vicious cycle downwards as asset values deteriorate which leads to more lenders leaving the market which pushes asset values down again until they become cheap enough for new capital to re-enter and reverse the cycle. So who is right? CFAs or the credit markets?